Outstanding Modern-Rustic with Great Views. This home has been recently remodelled with a touch of class. An open living concept, with plenty of glass, that takes advantage of the amazing views that are offered from the property. Soaring ceilings, accented with timber beams, concrete counters, hardwood floors, stainless appliances, concrete fireplace, combined with the steel and wood siding give this home a fascinating rustic-modern feel. 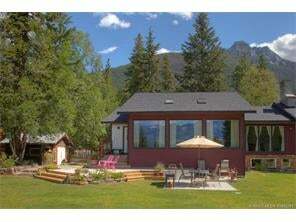 The property offers a private setting, yet is only 8 kilometres from town. The new 640 sq ft master suite has yet to be finished, fixtures, flooring, and paint are left for you to complete to your personal taste. Floor Area 3,956 Sq. Ft.